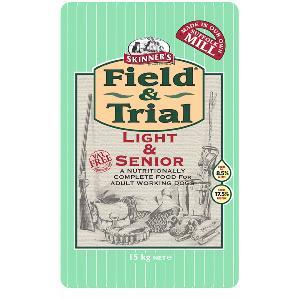 Skinner's Field and Trial Light & Senior has been specifically formulated to meet these needs of senior or over weight dogs. Like humans, some dogs can be prone to weight gain as they become older or less active. Neutered or spayed dogs can also be prone to excessive weight gain due to reduced energy requirements. Older, overweight or less active dogs still need a carefully balanced diet, with high quality ingredients to maintain their health and condition.